The memory ok "Big Babol"
"Grands Crus Valrhona" chocolate tasting with a glass of Rum "Diplomatico Riserva"
Cucina Tipica Toscana e non solo...Paste fresche e dolci realizzate entrambe artigianalmente dal nostro chef, specializzati in carne di Chinina Certificata cotta alla brace, bistecche alla Fiorentina.Ampia cantini di Vini del Territorio ed Enomatic per degustazioni al bicchiere. We had a fabulous Christmas Eve meal with our family of 6 in Montepulciano on Christmas Eve. They placed us right next to the fire and we had a fabulous meal. We even met a very nice family sitting next to us in the restaurant. The waiter was very attentive and our evening was just perfect. Highly recommend! Great food and really nice staff. We had salt cod shashimi and cheese brûlée for starters both were very good and presented in a Blumenthal way. Fillet beef and traditional salt cod to follow which we both thoroughly enjoyed, quite large portions, didn't really need side dishes. We both really enjoyed the night service was attentive without being intrusive, would highly recommend and not too far up the hill. Wonderful service!! Food was fantastic!! Loved the ambiance!! Lovely restaurant with an attentive staff and a creative, delicious menu. We thought it was just wonderful! Uno dei migliori ristoranti in assoluto a Montepulciano. Sono eccezionali su tutta la linea. Diventerai rapidamente un cliente abituale! 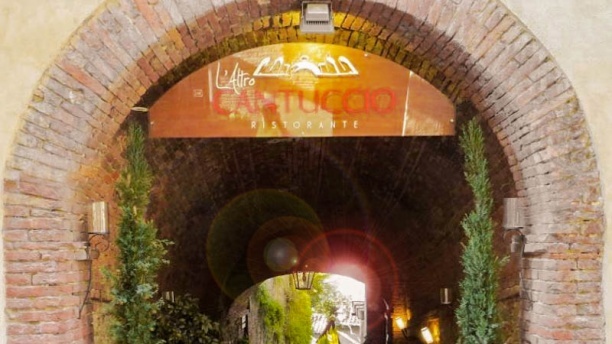 One of the best restaurants in Montepulciano. They are exceptional across the board. You will quickly become a regular customer! Great romantic spot. The food was amazing. The Good was excellent, and served in a very modern way. We liked it a lot. Unfortunately the lamb was not medium rare but fully well done. They changed it immediately. Perfect! Very nice and polite staff, the cook was delicious and very fine (beef with Montepulciano wine reduction, salt cod), in a lovely environment under the arcades. We highly recommend! One of if not the best place in montepulciano!